Bi Folding Doors Wood or aluminium ? Bi Folding Doors Wood or Aluminium is a common question. There is only one answer, aluminium every time. But did you know that aluminium bi-folding doors also come in many lovely Wood grain finishes. They show the natural effect of wood yet give you all the benefits, strength, slim sight lines and minimal looking after of aluminium. Cheam’s Origin Bi-folding Doors are the perfect way to co-ordinate with existing windows and doors. Perhaps you prefer modern or traditional finish. The many colours available allow you to make a statement with a bold colour or simply match the colour of your home. No matter how selective your tastes, we can offer a colour choice to meet every style and match every home. You can even choose to have doors with different colours inside and outside your home, giving you almost endless options. Bi Folding Doors Wood or Aluminium – Look at these High quality wood grain effects! 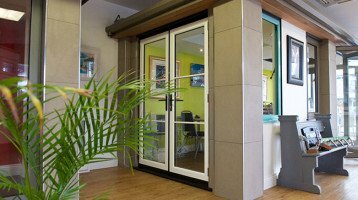 If you are looking for Bi-folding doors in Surrey, we have showrooms in Banstead, Hampton Court and Worcester Park. Here you can view the Origin Easifold Bi-folding Door installed for you to see. What you may not know is that the wood effect finish looks like wood and has the beauty of real wood, and feels like wood. These lovely wood or wood grain bi-folding doors are possible due to a process which allows high quality wood grain effects to be made with aluminium. They also have the protective advantages of aluminium polyester powder coating. Considering Double Glazing in London and Surrey ? Cheam Windows are now one of only a few companies to be using the latest pricing technology. If you are looking for double glazing prices in London and Surrey, the prices you are quoted will be accurate first time. And every time, as we use the very latest state of the art software. The traditional paper price list is a thing of the past at Cheam Windows. We do not rely on over inflated paper price lists that can be decades old. Our in-house pricing software is designed for fast accurate quotations, giving you instant prices. Pricing can be changed at the touch of a button should you wish to see variations in other colours or types of glass . Above all, everything will be well presented in either paper or electronic format and when you make the wise decision to use Cheam Windows for your replacement doors and windows. All paperwork will have been prepared quickly and without fuss. Looking for any aspect of window and door home improvements ? contact us today for a free no obligation chat. We know that Window Security and the safety of your home comes first. So we use the best defence to provide high window security. And keep the style and design! 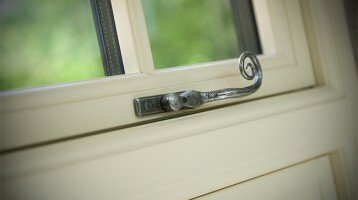 Our windows are fitted with the leading rust resistant shoot-bolt locks, exceeding BS7950 security requirements. We also provide extra hinge bolt security to each ground floor window casement. This gives added window security to the hinges from forced attacks from any intruders. Break-ins through doors fitted with euro-cylinders are on the increase. High demand from victims and crime reduction authorities for a solution have been met with the introduction of the Squire Stronghold® SnapsafeTM cylinder. As the illustration shows, the cylinder will snap at a pre-selected position. This leaves an in-built security zone inside the door furniture, with at least three active pin chambers. The would be thief is now faced with taking more time to pick the lock and will usually give up. In most cases, even after the attack, the key holder will still be able to open the lock. Burglaries are often made through unlocked doors or windows. High quality locks are a visible deterrent. Make sure you always choose the best door locks for your home. For more details and to see our Window and Door Security range, visit our Window Showrooms in Banstead, Hampton Court and Worcester Park. We would be very pleased to see you ! Window Glazing options aren’t always very clear, the range of choice for design and color is incredible. Internal window boards/cills are often horned into the wall either side of your window and are unable to be removed without creating disruption to the wallpaper or plastering. Most internal window boards/cills are in good order as they do not suffer from external weathering. During installation, your windows are finished internally with a series of PVCu architraves and trims to match in with your PVCu windows. Alternatively, we can finish internally with timber architraves and trims. This only applies to certain windows so ask your window planner for more information. All timber architraves are installed to a pre-decoration standard. The end result looks great and can restore the existing character and features of your windows. For security and privacy, we offer a wide range of glass styles which offer different levels of obscurity. Over 500 colour options are available for our extensive window range, our experienced sales team can advise you further.